Last night was a zucchini night at my house. 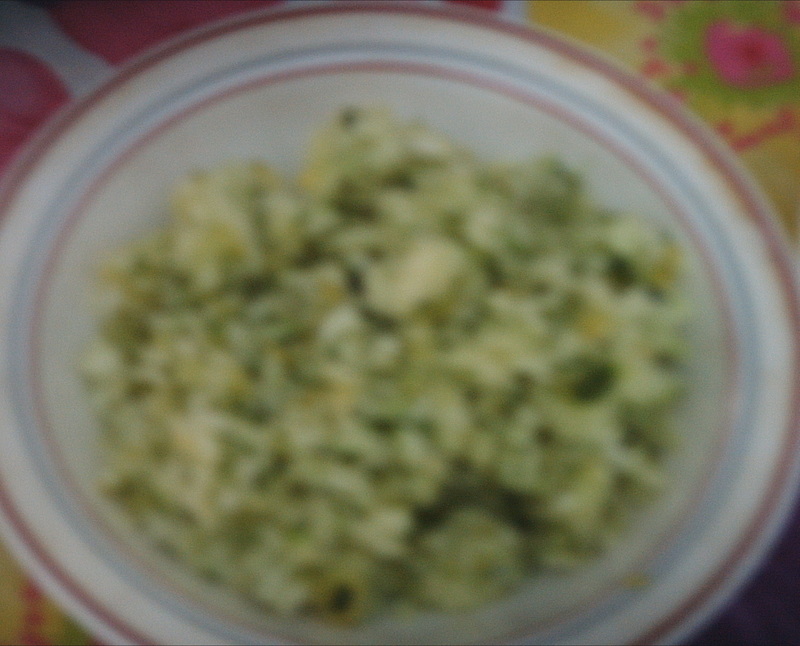 I had come into some zucchini and wanted to use it so that it did not go to waste. I use zucchini – as can be seen in previous posts – a lot and in a varied number of ways so yesterday was no different. I started the day off with my ideas. I then pulled out my Oscar Jr. You see, for all the cooking and baking I do, I do not own a food processor. I either process everything by hand with a knife or use my Oscar Jr which is simply a chopper. I decided I wanted to chop up the zucchini as opposed to using a mandolin or dicing by hand. I, then, also chopped up carrots in the Oscar Jr. I went on to dice a Ginger Gold apple and toss it in a bit of lemon juice. I made the “slaw sauce” in a cleaned out mayonnaise jar so I could shake it until it was well mixed. 1. Prepare the zucchini. Set aside in colander to drain. 3. 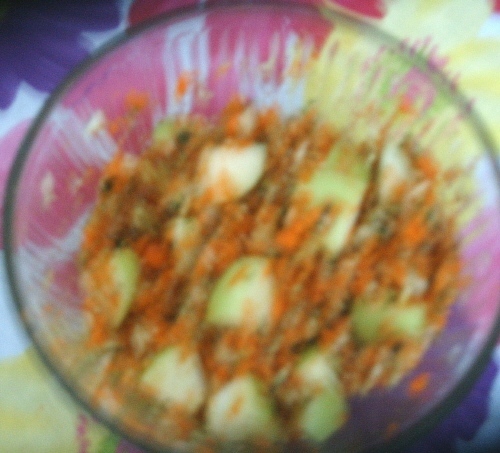 Place zucchini and carrots in medium size bowl and toss together. 5. Toss apples with lemon juice and then remove from lemon juice. 6. Toss apples in with zucchini and carrots. 7. Find smaller bowl or bottle to make sauce in. 8. Place red wine vinegar, brown sugar, celery seed, onion powder, salt and olive oil in container and mix or shake to blend. 9. Pour sauce on zucchini/carrot/apple mixture. 10. Refrigerate to allow flavors to blend. I thought I would make zucchini brownies but opted instead to make zucchini patties to go with the slaw for dinner. Knowing that my sons would both stick their noses up at the idea of a dinner with just zucchini in it, I planned on spiedies for them and the zucchini tastes would be their vegetables for dinner. 1. Dice or finely chop the zucchini to give 2 cups. 2. Lightly beat eggs in mixing bowl. 3. Add zucchini, parsley, flour and cheese. 4. Salt and pepper to taste. I tend to use very little salt but lots of pepper. I even put a little cayenne in to give a bit of a kick. 5. Pre-heat a sturdy frying pan with about three tablespoons of olive oil. 6. Drop in mixture similar to making a pancake but will be thicker. 7. 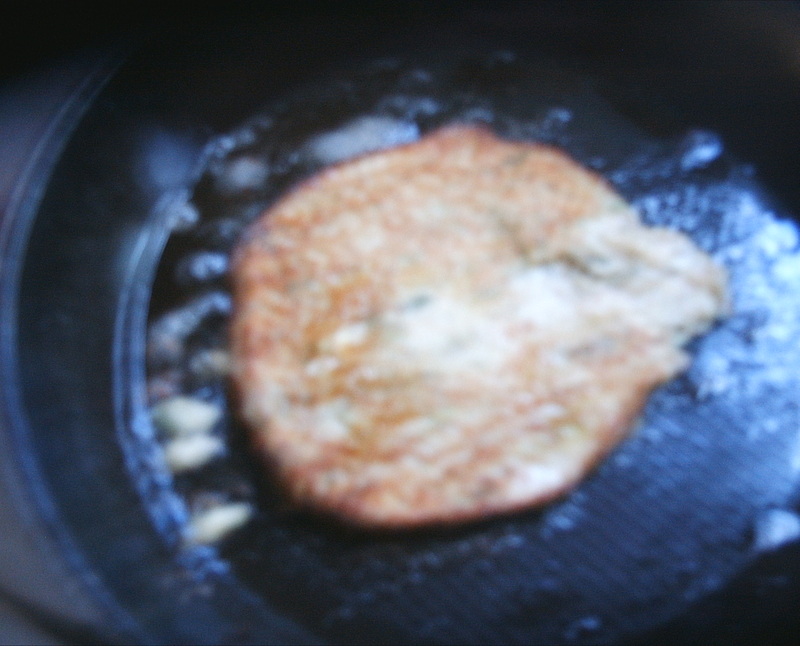 When pan side is browned and top is not runny, flip. 8. Remove from pan onto a plate covered with a paper towel to remove oil.